For 15 years, we’ve been penning these letters—30 so far. The biggest news around here is that we are celebrating the 15th anniversary of the opening of the O.Henry Hotel and Green Valley Grill! In an insert to this letter, I ramble on about what we see in the rear view mirror and out of the windshield at these wonderful places. Read on for details about the special happenings we’re planning for the holiday season, along with other updates from all of our places. As always, we are honored that you choose to receive these letters. If you don’t want to continue to get them, email us at qwrhinfo@qwrh.com. Conversely, if you wish to receive these and more frequent news and happenings electronically, please sign up for email updates on our websites, or follow us on Facebook. As usual, many contribute to these letters, but they are primarily written in first person by me, Dennis. A Memorable Shindig: Share a tale about a social event at the O.Henry—maybe a wedding, a private dinner, non-profit fundraiser, a B’nai Mitzvah or a private dinner. It’s the Little Things that Count: Tell a story about a staff member who did something extraordinary. Afternoon Tea: Here’s one: Recently, I noticed a woman taking afternoon tea in the lobby with four friends. Three were sitting with her, and her boyfriend joined in from Denmark via FaceTime on a laptop! Green Valley Grill: There are bound to be some great stories after 15 years of lunch and dinner! Email your story to ohenry15@qwrh.com or mail it to Quaintance-Weaver (324 W. Wendover Ave., Suite 320, Greensboro, NC, 27408) by January 15. See the 15th Anniversary section at ohenryhotel.com for winning stories. Big News! O.Henry Hotel has been selected to be a member of the new Southern Living Hotel Collection. This is a huge honor because their editorial staff invited us to join this impressive group of 20 independent top level hotels and inns that embody the best in authentic Southern hospitality. We are currently collaborating with the Southern Living team on some exciting events for 2014. Stay tuned…. More Accolades: On TripAdvisor, we are ecstatic that O.Henry has been the top-rated Greensboro hotel all year (no small feat, that…)! Plus, AAA awarded us the Four Diamond Award for the 15th year in a row. Special Packages: Take a romantic getaway and enjoy nearby musical performances, art, theatre and shopping. To reserve these and other packages, please call 336-854-2000 or go to ohenryhotel.com. Ring in the New Year Package: Start your evening with a bottle of sparkling wine in your luxurious guestroom. Then, take advantage of priority dinner reservations at Green Valley Grill. Watch the arrival of 2014 in your room, snuggled with your honey…or have a midnight toast in the Green Valley Grill bar, open until 1 AM. Sleep in with a late checkout of 2 PM. $249 plus taxes – and stay an extra night on that Sunday or Tuesday for only $100 more. 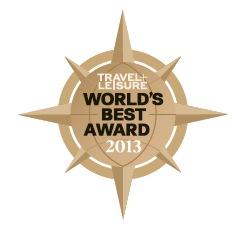 Accolades: We are honored to continue to again receive the Travel+Leisure’s 2013 “World’s Best” Award, the “Best of Weddings” award byThe Knot magazine, AAA’s Four Diamond Award for the fifth year, and TripAdvisor’s Green Leaders Platinum Level rating. Stay Centered: Escape the holiday hubbub and focus on relaxation with these limited-time specials and packages. For reservations and more package ideas, please call 336-379-8200 or visit proximityhotel.com. Proximity to Midnight N.Y.E. Package: Start the celebration with a bottle of sparkling wine in your Loft King Room. Continue the night with priority dinner reservations at Print Works Bistro, and then say cheers to 2014 at the Print Works Bistro New Year’s Eve party, open until 1 AM. The next morning, relax with a late checkout. $249 plus taxes – and stay a second night for $100 more. Turkey-to-Go: This has become a tradition for many, including us! Enjoy Chef Leigh Hesling’s amazing rotisserie turkey at home. Place your order by 10 PM on Monday, November 25, then stop by the Caldwell Room at O.Henry Hotel on Thanksgiving Day (10 AM–3 PM) to pick up your juicy, wood-fired, rotisserie-roasted turkey with all the trimmings, including sides, salads, bread and dessert. To learn more or place your order, call 336-854-2015 or visit greenvalleygrill.com. PLAYING THE TOY SOLDER IS A TRADITION FOR GVG STAFF MEMBER KENNETH NASH, JR.
Nutcracker Tea at O.Henry Hotel: This holiday tradition continues to grow, so you can now choose from four Sundays: December 1, 8, 15 or 22 at 2 PM. 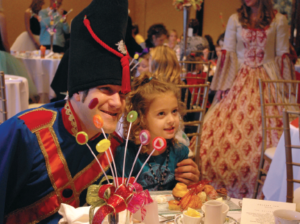 Bring your camera to capture smiles and delights as children of all ages enjoy amazing creations by our extraordinary pastry team—inspired by dreams of dancing sugar plum fairies, toy soldiers and waltzing flowers. Talented actors in character mingle, while each child decorates an ornament and helps our chefs make gingerbread houses. Afterwards, join Clara by the tree for the story of The Nutcracker. $44 per person, plus 20% service charge. Call 336-854-2015 for reservations. Learn more. Christmas-to-Go: (Moved from Print Works Bistro to Green Valley Grill this year!) Give yourself the gift of a hassle-free celebration at home. Let Chef Leigh Hesling and his team prepare your “Christmas-to-Go” with selections of turkey, prime rib, lasagna and traditional á la carte items. Place your order by 10 PM on Sunday, December 22, then stop by the Caldwell Room at O.Henry Hotel on Christmas Day (10 AM–3 PM) to pick up your holiday feast. To learn more or place your order, call 336-854-2015 or visit greenvalleygrill.com. Holiday Hours: On both Thanksgiving and Christmas Day, Green Valley Grill is open from Noon–8 PM (serving our dinner menu plus traditional favorites), and the bar is open until 10 PM. Holiday Dining: On both Thanksgiving and Christmas Days, Print Works serves several holiday specials in addition to our full dinner menu from Noon–8 PM. The bar is open until 10 PM. Plus, we offer breakfast from 7–11 AM. On New Year’s Day, we’ll offer our brunch menu from 7 AM–4 PM and dinner menu from 4–10:30 PM. For reservations, call 336-379-0699 or visit printworksbistro.com. New Year’s Eve Celebration at Print Works Bistro: On New Year’s Eve, choose from a full dinner or prix fixe menu. Celebrate the arrival of 2014 with DJ Jessica Mashburn from 10 PM–1 AM. No cover charge. Mussels-Wine-Music: On Wednesday nights, we’ll continue our mussels and fries special for $15, five wines under $15 a bottle and live music from 7–10 PM by AM rOdeO with Evan Olson & Jessica Mashburn (no cover charge). Reservations recommended! Evan & Jessica take a holiday break on December 25 and January 1. Cooking Classes: Looking for a great gift idea for a foodie? 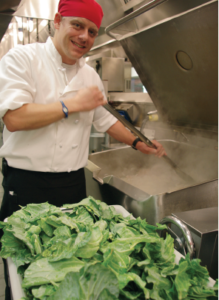 Tickets are now available for Chef Leigh Hesling’s 2014 cooking classes. There will be three at Proximity Hotel (February 15, June 14 and September 20) and three at O.Henry Hotel (March 29, July 12 and October 25). 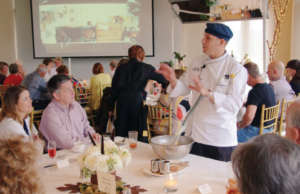 Enjoy a seasonal beverage during a cooking demonstration, then savor the food during a three-course meal with wine. Tickets are $80 per guest, or get a three-class package for $225. For tickets, contact Lee Healy at 336-478-9126 or lhealy@qwrh.com. Flavor NC: Chef Jay Pierce of Lucky’s teams up with Plum Granny Farm to prepare recipes with garlic on “Flavor NC,” a popular series that searches out the best of Tar Heel agriculture and food. Check it out on UNC-TV November 14, 16 and 17. Farm-to-Fork Blog: If you haven’t been following Chef Pierce’s exploration of piedmont foodways with features on farms, seasonal finds and recipes, you have missed out! 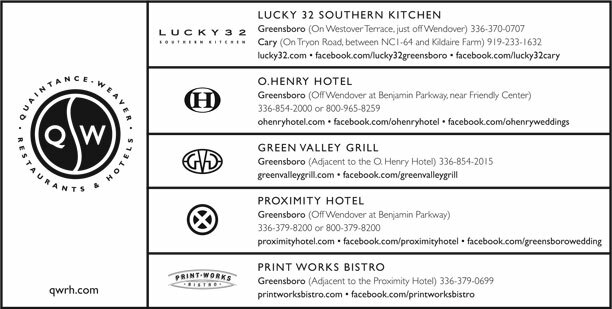 Read all of the past 60 features and sign up for notifications for new ones at lucky32southernkitchen.com. November 12 – Martha Bassett & Friends, 19 – Molly McGinn, 26 – Martha Bassett & Friends, December 3 – Molly McGinn, 10 – Martha Bassett & Friends, and 17 – Molly McGinn. Singers take a holiday break on December 24 and 31. Voodoo Sauce: Our table sauce for grownups continues to find its way across the world! We’ll even ship it to you (order at lucky32.com). And, in addition to buying it at both Luckys, you can now find it in all Fresh Markets, Harris Teeter (Triad & Triangle), Kroger (Triangle) and Whole Foods (Cary & Greensboro). Find plenty of serving ideas and recipes at lucky32.com. Holiday Dining: Lucky’s in Cary is open Thanksgiving Day from 11:30 AM–7:30 PM (serving our dinner menu plus traditional favorites). Lucky’s in Greensboro will be closed on Thanksgiving. Both will close after lunch on Christmas Eve and will be closed on Christmas Day. Get Lucky & Go: If you are invited to bring a covered dish, we’ve got you covered with half-pint and pint options of collards, soup, beans and greens, whipped sweet potatoes, creamy grits, pimento cheese, artichoke dip… and don’t forget the black bean cakes! See menus at lucky32.com. New Year’s Lucky Menus: Get our full menu, plus some “good luck” food like collard greens, country ham with red-eye gravy, grilled pork loin chops and hoppin’ john. If you are entertaining at home, take advantage of our “New Year’s Day To-Go” with family-style portions of traditional side dishes to bring and pass off as your own! On New Year’s Eve, the bar in Cary is open until 12:15 AM and in Greensboro until 11 PM. 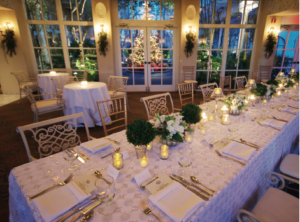 Our guests and wedding specialists create some of the most amazing weddings anywhere! We now feature one “dream wedding” each month on our photo journal blog at GreensboroDreamWeddings.com, and we plan to host a Southern Living Wedding Workshop at O.Henry Hotel in February 2014. If you know a bride-to-be, please share this news with her. Lucky’s in Cary: Up to 70 people in a semi-private dining area. Call 919-233-1632. Lucky’s in Greensboro: The private Starlight dining room seats 10, and we can host larger parties in the dining room. Call 336-370-0707. Green Valley Grill: Up to 30 people in our dining rooms. Call 336-854-2015. Print Works Bistro: Up to 30 people in a semi-private dining area; we open at 6:30 AM for breakfast Monday through Friday (a great time for workplace holiday celebrations). Call 336-379-0699. Visit printworksbistro.com, greenvalleygrill.com and lucky32.com for the current seasonal menus, lots of recipes, the latest wine list and online reservations. We offer “call ahead seating” for those situations when you want to dine with us but do not have reservations, and you are concerned about waiting for your table.With larger parties, we offer pre-ordering to expedite service so you have more time to enjoy your visit. Let us know when you make a reservation if you would like to pre-order. Just fax us your orders by 10:30 AM at lunch and 4 PM at dinner, and we’ll have your meals served within minutes of arriving. Call the restaurant or click here for a pre-order form. Visit printworksbistro.com, greenvalleygrill.com and lucky32.com for the current seasonal menus, lots of recipes, the latest wine list and online reservations. We offer “call ahead seating” for those situations when you want to dine with us but do not have reservations, and you are concerned about waiting for your table.